Here is a post from Becky, who took one of my classes in Utah this last weekend: she is a young enthusiastic quilter who has her own patterns and blog…she is currently doing a 52 week series on making things with your extra blocks you may have around… i have drawers full!…visit her blog here and meet Becky! Her post is titled 10 things I learned from Primitive Gatherings! Next Post Fat Quarter Quilt Shop-Designer Block of the Month! Love your antique quilt and can not wait to see what your recreation looks like in wool. And I’m sure its not said often enough you are by far one of the most encouraging sharing designers out there; I have known many people who have taken classes with you and all have the most wonderful things to say about how great of a teacher and encourager you are. Can not wait until an opportunity arises to be in one of your classes. I just read the Patchwork Posse blog. It only makes me want to take one of your classes that much more. And I will, when I can get to where you are one of these days. Looking forward to finding ways to use my many orphaned blocks. Took too many patchwork classes and not enough time to finish anything back in the day when my kids were young. So now I have too much unfinished business…and fabric I probably wouldn’t choose these days … but don’t want to toss or donate just yet. Still thinking there’s potential … Hoping the site you referenced will help me plow through some if it! That’s a beautiful block…I’m sure your version will be even better! Any idea if there is a Juki dealer at Road? I want to try out the machine you rave about and our local dealer doesn’t carry it. My serger is a Juki so I am familiar with them. Thanks Lisa! See you tomorrow! I hope I get a chance to take a class with you in the future. Can’t wait to see your version of the antique quilt. I bet it looks wonderful in wool. Beautiful quilt … and I love the borders too. Will you do a pattern? Experience, the best teacher and you have plenty of that, Lisa! Thanks for telling us about Becky and her blog. Love, love, love the antique quilt!! Looking forward to the pattern!! Thanks for the “Becky blog” too!!! I can see why you are redoing that quilt. It is awesome as I am sure your quilt will be also. Thanks for sharing. I recognize this quilt top; so happy that you have it & excited to see what your version will be like! After many years of snoring he recently went to an ENT doctor, tried the CPAP machine (forget it). This thing sounds like a vacuum with your hand on it when not in place. So the doctor suggested surgery, cutting the nose & throat (not happening). I feel your pain not being able to sleep. Lisa, I look forward to your inspirational project. I love how the quilter used the traditional nine patch setting, but did not do the traditional alternate placements of the blocks. I also like that she didn’t line all the blocks up inthe same orientation. I can’t wait to see what your colour twist is for your quilt. It is so wonderful that you can share your time and talent with so many. I believe you are the Energizer Bunny. Surely enjoyed the class I took and hope to do it again very soon. I have taken 3 classes from you and all were GREAT!!! You are a wonderful teacher and it is so nice of you to share you love and knowledge of quilting with us. This is exactly what you were meant to do. Hope to take another class soon. love it love it – can’t wait to see your creation – just keep it coming. I wish I could have been in your class in Utah. I have family there. Next time you have a class I will have to visit them! I love the antique quilt. It is so beautiful. I also like the borders. Lisa, can’t wait to see your version!! Do you have instructions for making a sleeve? I really like the antique quilt, and I can not wait to see how you personalize it and make it your own. Thank you for sharing the blog and your students 10 tips!! Many great ideas that were worth sharing! Thanks Lisa for sharing my link! I am excited to meet the new readers you sent my way. 🙂 Glad to find such a talented designer and one who shares what she knows. It was a pleasure! Thanks again. 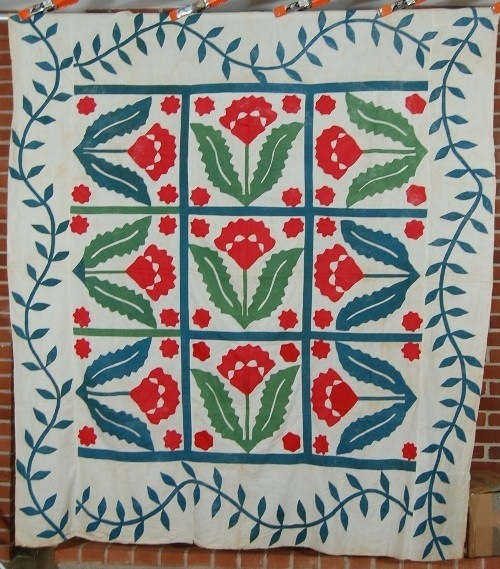 I love that you’re doing a wool quilt based on this old quilt. i’ve been perusing books trying to put together an old-timey aka “classic” applique quilt, only in wool. I look very forward to seeing this in the future. I also love that blue color. though my wool collection is out of control right now, i would jump to buy a piece that faded out green/blue color.